-My cat likes the Olympics more than I do. I have been watching more than I ever thought I would (ahem, women's archery) but I still think the kitten likes it more than I do. He sits in front of the screen for ages staring and then eventually tries to paw the athletes. So either he loves sports or really hates the Chinese team. Who knows? -I may be capable of more than I think. On the whole I'm a doubter about athletic ability. I'm middle of the pack, but even then I can't embrace the good stuff. This week was a higher mileage week for me lately (at 44 miles). I know that may not be a ton for some runners, but it was excellent for me. And with no pains or problems, I feel like I can keep going. Boom. -There is no way to escape Ikea without spending more than you planned. On Saturday we went in for a mattress (Tim's mom is coming to visit on Saturday!) and left with a closet, a bunch of baking trays and a carafe. A carafe. Apparently I really need that? I also learned that if you ask nicely, you can get your frozen yogurt from Ikea in a cup instead of a cone. It costs an extra 50 cents, but you get easily twice as much. Yes please. 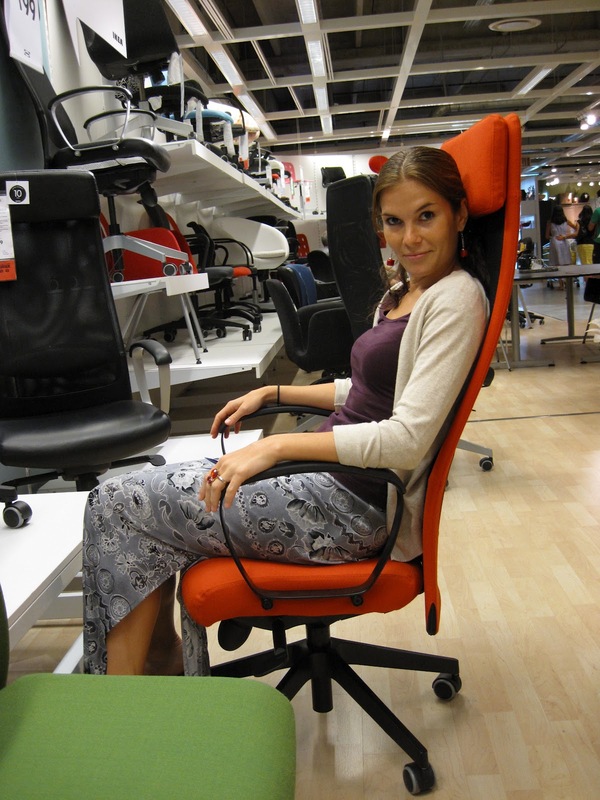 Random old photo from Ikea. Relevance? 2/10. What do you women (or long-haired men) do to keep your hair from going crazy in high temps and humidity when running? I have a ton of Active Bands, and love them, but they seem to make it worse somehow in humidity. My new plan is to close my eyes when I walk past a mirror and just let it go. Are you watching the Olympics? Any favorites? I watched a little of the swimming, gymnastics and archery over the weekend, but I'm only really interested in the running events. Especially, of course, the women's marathon next Saturday morning! Couldn't agree with you more on Ikea. Always end up with more than we planned and in our household, an Ikea trip always ends in an argument too! 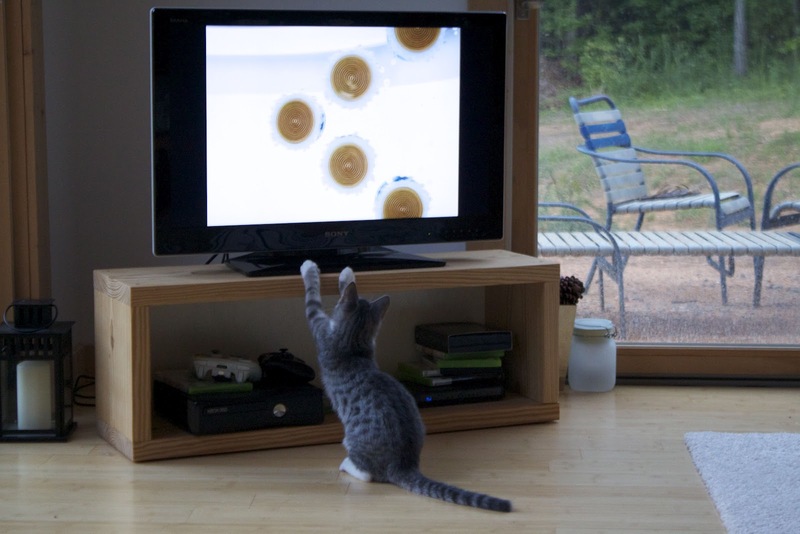 Haha, love the kitty watching the Olympics. I'm quite intrigued by the coverage this year too! Oh how I wish we had an IKEA in Hawaii! Speaking of high temps and humidity- when my hair was longer I used to put it in a braided ponytail and top it off with a headband. Now my hair is shorter and my exercise routine is nonexistent so it just lays on my head. We watched men's cycling for a little bit. I really love gymnastics and swimming though. Who am I kidding? I love it all! I really really love the Olympics-- it's home whenever I'm home (which admittedly is not as often as I'd like...stupid grad school.) I don't care which sport's being covered at the moment- I marvel at it all. Regarding hair, have you ever tried to run a little bit of oil through the end of your ponytail? It sounds a little counter intuitive, but it works really well for me. This is the kind I have-- you only need a tiny little bit. Good luck! I am loving the olympics. I even sat through the entire water polo match yesterday. Weird. I relearn lessons all the time. Mine usually involve eating something unfortunate too close to a run. My digestive system loves me. I have been watching gymnastics and swimming mostly. I use hats. Love hats. Keep my hair contained and help keep the sun off my face. Awesome. If your cat watches TV, then it's much smarter than my dog. Peanut just freaks out if she hears a doorbell on TV and doesn't understand at all. I used to have a terrier growing up that actually watched TV, but that dog was scary smart. We don't have fancy things like "Ikea" here in the boondocks. 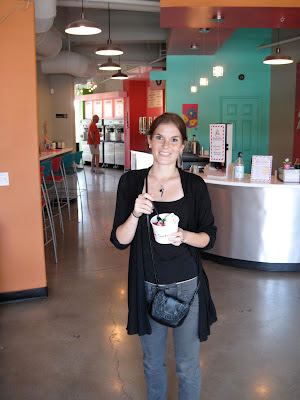 OK, all your talk about frozen yogurt is making me crave some right now :) My hair is a MESS in the humidity. This summer I have resorted to piling it up on top of my head in some form of bun….it's still a mess, but at least is a little more contained! hats is the way to go, it hides it all!!! the Olympics are messing with my sleeping schedule...I watch it all! I have been to Ikea like twice and I dread the thought of ever going again - so overwhelming it makes my head hurt just thinking about it. For my 50K I loaded my hair with superpower gel while it was wet and french braided it, threw a noodle hugger in, and it didn't move the whole time. We watched the Olympics all last night! I almost cried when Jordyn Wieber (sp?) didn't make the all around finals! My hair is crazy even on a "good" day, so I don't give it a whole lot of thought. Or I wear a hat. I'm enjoying the Olympics, but haven't been watching a ton. I think the women's gymnastics team looks like a bunch of high school mean girls, so it's hard to root for them. I love that picture of your cat, of course. I seem to just throw my visor on and not worry about it, LOL!!! The only thing I could possibly do to tame this hair in humidity would be shave my head. I hadn't been in an IKEA store for years but last week we stopped at a new one in Vancouver... arrived just as they opened for breakfast, so we had some.... shopped forever and had to have lunch there and finally left after another couple of hours and still had not seen it ALL. OMG. 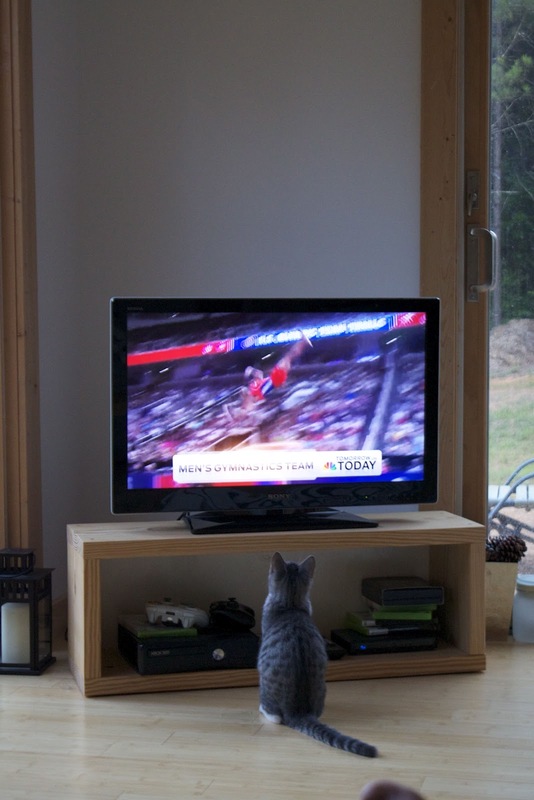 The kitten watching the Olympics is so cute! Luna loves to watch TV on the laptop and will paw at the screen too. I always enjoy reading your posts - sorry I've been awol for the last couple of weeks. Girl - I have natural curly hair that becomes a FRO in the humidity. I usually wear something (visor, bondi band) just to keep the curlified fly-aways out of my eyes and then just laugh at the craziness of it all when I see myself in a mirror - so embarrassing! I watched the womens team archery over the weekend for the first time in my life - really really interesting. I'm a big Olympic fan - love swimming most of all, but also enjoy moderate amounts of pretty much everything else. I feel you on the hair woes (well, and Ikea and frozen yogurt and Olympics too. My cat, however, is completely indifferent to sports). I have short curly hair so I either have to wear a hat or else I wear a bandanna, do-rag style. 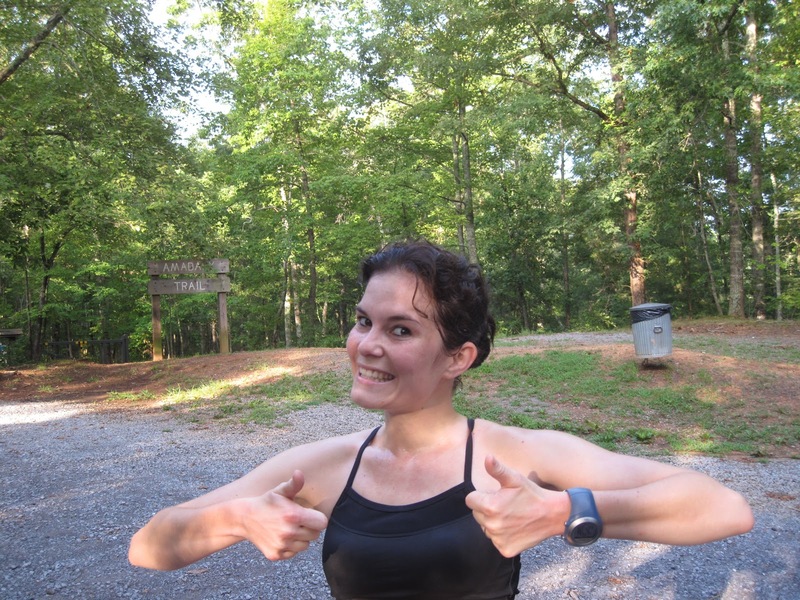 I have to keep my bangs out of my face, and the horror of my hair at the end of a run is just more than anyone should have to see. ohhh we haven't been home for me to see if the cats like the olympics!! i can't wait to fly back now and find out! I love the hair! What's wrong with it? Also, I hope that was self serve frozen yogurt...do you have that there? Here it is hit or miss, but I prefer to serve myself (and taste each flavor beforehand, naturally). I'm not sure there's anything to do to control hair in Southern summers with high humidity so if you figure something out, let me know! Your kitten has a fellow Olympics fan in Sasha. She's been skipping her naps to watch the Olympics and it's hilarious.